I can’t remember the last time I heard a theatre full of people (many of them critics and online influencers) in Los Angeles all say, “AWWWWWWWW” in unison multiple times during a film. There was also a lot of loud sniffling, most of it coming from ME, during Disney’s CHRISTOPHER ROBIN. This movie is an absolute treasure, and even though I am a total freak for anything and everything Marvel, this kind of heartfelt, beautiful film is what I feel Disney does best. CHRISTOPHER ROBIN (based on the beloved characters created by E.E. Milne and E.H. Shepard) opens with young Christopher in the hundred acre wood, preparing to go to boarding school and saying goodbye to Winnie-the-Pooh, Tigger, Eeyore, Kanga, Roo, and all of his friends. Cut to thirty years later, and grownup Christopher is a stressed-out workaholic, working crazy hours at a luggage company as an efficiency manager and ignoring his wife, Evelyn, and young daughter, Madeline. After canceling plans to go to the country with them for a weekend so he can work and attempt to solve some of the company’s financial problems, Christopher’s past catches up with him, in the form of Winnie-the-Pooh on a London bench. This is a live-action adventure, and Ewan McGregor as the adult Christopher is terrific. ; even when he is stressed out and angry I still felt such empathy for him. And the moments that he and Pooh (voiced perfectly by Jim Cummings, who is also the voice of Tigger) share together are pure cinema magic. Ewan has created a grownup Christopher Robin that I am guessing a lot of the parents in the audience can relate to, as he seems to know that there is a better way to live his life, more in line with who he truly is, but he just doesn’t know how to get there. Christopher talks about how one day things will be different, and is reminded that his life is, in fact, happening right now in front of his eyes. Christopher’s wife, Evelyn, is played by the lovely Hayley Atwell (who Marvel fans will recognize as Agent Peggy Carter), and the adorable Bronte Carmichael is their daughter, Madeline, who is already showing signs of turning into a stressed-out perfectionist like her dad. CHRISTOPHER ROBIN reminded me a little of FINDING NEVERLAND, which made sense when I realized both films were directed by Marc Forster. I wish I could give individual shout outs to everyone in front of and behind the camera for creating such a beautiful film! A fun casting note: Brad Garrett from EVERYBODY LOVES RAYMOND is the voice of Eeyore, which the audience loved! 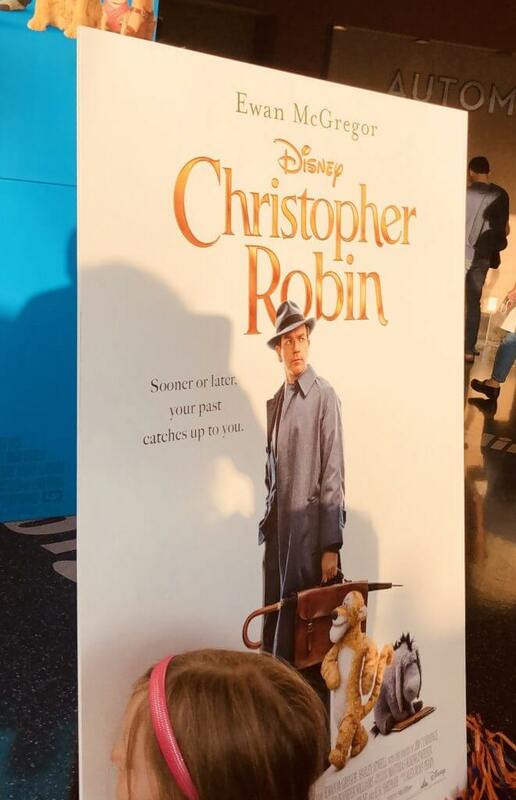 My eight-year-old son said that this was one of the best movies he has ever seen, and while he did have a few questions about the mess that Christopher has made of his life (“Mom, why would he ignore his daughter?”), I feel comfortable recommending the film for all ages. In today’s fast-paced world, CHRISTOPHER ROBIN is a breath of fresh air, and a gentle reminder that often, doing nothing with a best friend is the very best kind of something. 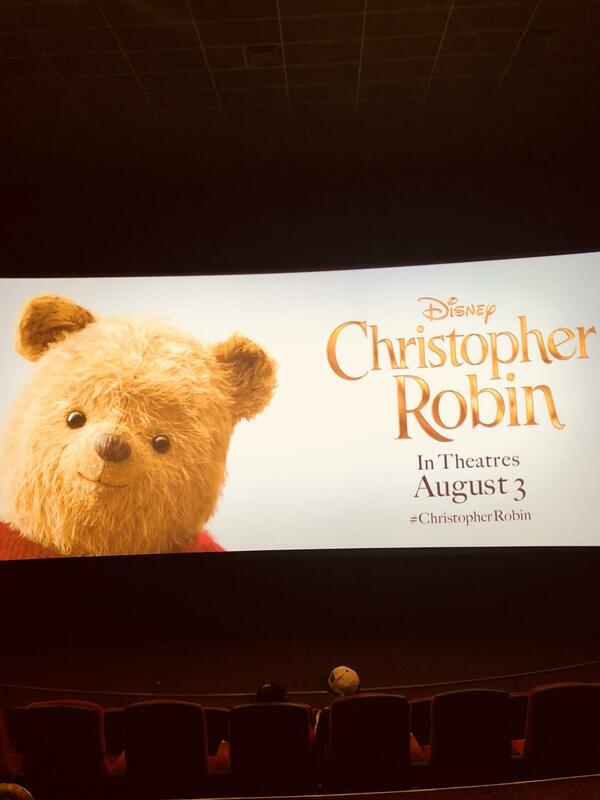 CHRISTOPHER ROBIN is rated PG, and opens in theatres on August 3rd, 2018. Previous articleThe Secret To Having a Great Day!